The first edition of the report Furniture Distribution in India offers an accurate comprehensive picture of the Indian furniture market, providing 2008-2013 trends, short (2014-2015) and medium term forecasts (2020). Statistics of furniture production, imports and exports are also provided. 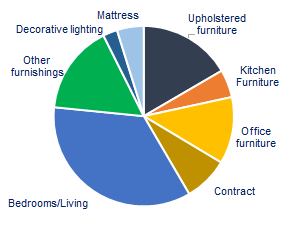 The furniture market is broken down by product segment 2013. Distribution channels and Reference Prices of the Indian furniture market are further considered both for domestically produced furniture and imported items. The analysis of the Indian furniture market includes: demand drivers (macroeconomic indicators, population distribution and construction market) and purchasing process among Indian consumers. The analysis of furniture distribution channels includes: Large scale furniture retailers, independent furniture specialists, architects and interior designers, E-commerce, local craftsmen and artisans (unorganized sector). Among the considered products: Living and dining furniture, Upholstery, Bedrooms, Home tables and chairs, Kitchen furniture, consumer lighting fixtures, Bathroom furniture, Office furniture, Contract and Hotel furniture. A specific analysis on main players in the distribution is given for the six states and eight megacities that are considered strategic for the future of the furniture business. Considered states include Delhi-Haryana, Maharashastra Maharashtra, Karnataka, Kerala, West Bengal. In the focused megacities a growth of household expenditure is given by around 50% from 2013 up to 2020, as an average. Around 40 short profiles of the main distributors and manufacturers, both for domestic and imported furniture operating on the Indian furniture market are also available. Addresses of around 400 Indian furniture manufacturers and retailers are also included and other 50 key contacts among fairs, magazines, architects and logistic companies. Addresses include web site and short presentation of kind of activity. Furniture consumption in India recorded 10% average yearly growth over the last decade, reaching about US$ 15 billion in 2013 at retail prices. A further 4%-5% yearly increase is forecasted for the coming two years. The Report focuses on suggested eight megacities and 6 Indian states where the outlook of growth of household expenditure is given by around 50% up to the year 2020. Branded furniture today has a market share of approximately 30% in India. With the ever increasing imports of low cost furniture, it has also challenged India's highly skilled carpentry industry. With the talks of IKEA investing Rs.10,500 crore (Euro 1.2 billion) after the recent policies to allow 100% foreign direct investment (FDI) in single-brand retail, competition is going to be intense in the near future for furniture companies in India. China, Italy and Malaysia are the main exporters of furniture to India.